Tron is very much a film that you either love or you hate. Most people that hate or find it hard to follow. I never had this problem. I do have to admit that I have always been a technical guy. I had my first home computer when I was 5, so I would understand all of the computer jargon that is mentioned in the film. In fact watching it again, I would guess I had a better idea that the writers actually did. The plot is about Kevin Flynn (Jeff Bridges) is a software engineer that has been fired from a company called Encom, after another software engineer, Ed Dillinger (David Warner) stole his code. Flynn has been trying to hack into Encom's Master Control Program (MCP) in order to find some evidence of Dillinger stealing his code, but his attempts fail. Alan Bradley (Bruce Boxleitner) is working on a security program called Tron. But is shut out of the system, thanks to the MCP and Dillinger noticing Flynn’s hacking. Alan and his girlfriend Lora, also Flynn’s ex, got to warn Flynn that Dillinger knows he’s been hacking into the system. When Flynn is told everyone is locked out then they realise that all three of them need to work together to find out what’s happening, with help of Alan’s Tron program. While doing this Flynn gets sucked into the digital realm, where he meets all of the different programs, which look like the users that created them. Flynn meets Tron and eventually helps to take out the MCP. Tron was way ahead of its time. The look and feel of the whole film is just nothing short of amazing. Even now watching it on Blu ray, you can tell it was something really fantastic. The only problem was that it didn’t quite work. Now I’m not going to pick apart the technical aspects of the film as it’s meant to be fantasy (although there are many issues). The idea was great; the look and feel as I said was amazing. The problem really was the story was too simplistic. Now I have heard that lots of people were confused about this film. I can’t say that I ever was. Although I can’t say I remember watching it for the first time, so can’t say if repeat viewing helped. Basically it was just the routine horrible character needs to be stopped and one man can do this. The story also seems to be confused over who the main character really is. The title would suggest the film’s main character would be Tron, but really it is Flynn. It’s his story, although it is Tron that destroys the MCP, but with a lot of help from Flynn. It seems that the writers just wanted to do a traditional hero saves the day story but needed to have other characters just forced into it. One great example is to bring in a love interest for Tron, with a program name Yori, who is based on Alan’s girlfriend. This character has no purpose what so ever. She does absolutely nothing. It just seems so bizarre to have this character in the story. 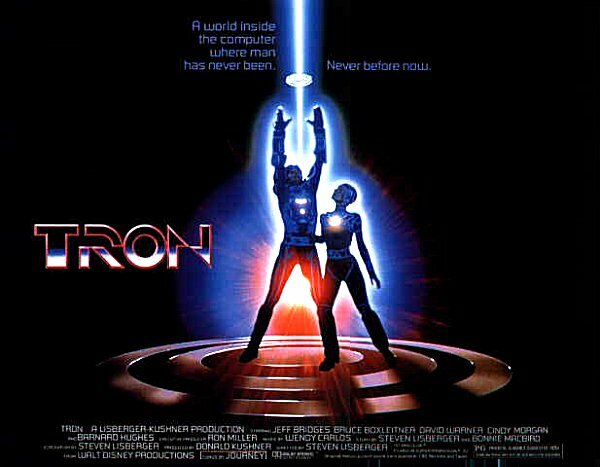 Overall, Tron is a film you will remember by the way it was made rather than the story. The innovation it brings is more important than the story it tells. As a computer geek from a child, it will always prove to be a something I will always love flaws included.